This week we our class was divided into small groups and we each had the opportunity to spend three days listening, collaborating and learning from various NGO’s that we were teamed up with. Myself and three other classmates had the pleasure to visit SEWA (The Self Employed Women’s Association). We spent the first day at the SEWA office here in Ahmedabad and were given a large overview of the organization. We were given presentations and watched a few different videos to get a sense of what SEWA does for the community. It was a very informative session and we learned so much about SEWA, I was astounded to learn all the efforts they do for women’s rights and empowerment in India. SEWA was established in 1972, by a courageous women named Elaben Bhatt. It was a trade union of women workers, originally in the textile industry. We learned about the struggles they went through. It took a year for them to become registered as a trade union as the labour department felt they did not fulfil the true definition of a trade union since there was no recognized employer. The women argued and made a case demanding that a union was not necessarily against an employer but was for the unity of the workers. Today it includes primarily women from the informal/unorganized labour sector, which accounts for 94% of India’s female labour force. These women earn a living through their own labour or small business and they do not receive regular salaried employment with welfare benefits like workers in the organized sector. SEWA prides itself in being both an organization and a women’s movement and reflects many of the core principles of development communication. Over the three days we learned about the amazing work that SEWA does to empower Indian women to enhance their lives and status in their communities and in society. On day two we had the opportunity to visit two villages and the IT centre in the field location where the department uses Skype as a form of communication to help surrounding villages communicate with each other and creates unity for the women and children. In the village of Manipoor we were welcomed by the men, women and children. One of the highlights from this day was when the women sang a song for us. They were very welcoming and happy to have us in their village and explain how SEWA has improved their lives. SEWA established the very first community radio in India for women and produced by only women. It is the women that own the station and decide the content and the stories on the radio. Community radio provides the women (who are most often illiterate) with stories, entertainment, education, messages and information on health and safety. It has proved to be beneficial as it is generally an inexpensive communication tool that women and their families can all have in their homes. Video is also another outreach method for education and capacity building efforts. Using participatory communication strategies video and radio focus on empowering women. It is the village women who are holding the microphones to listen, share and influence the content that will be delivered on the videos and radio programs. There is also three different SEWA print publications, an e-newsletter, a monthly magazine for young girls and a member based newsletter. In additional to visiting the villages we had the chance to visit SEWA Bank on day three. The bank was established as a crucial element to help women succeed as workers as most poor and illiterate women are denied bank accounts from regular banks. Issues concerning the caste system was also a huge barrier for these women. An inspiring story that was explained is how Ela Bhatt (the founder of SEWA) would lock illiterate women in a room and not let them leave until they learned how to sign their own name. This allowed them to sign in front of a register and gave them confidence and self-worth to be proud of their work. 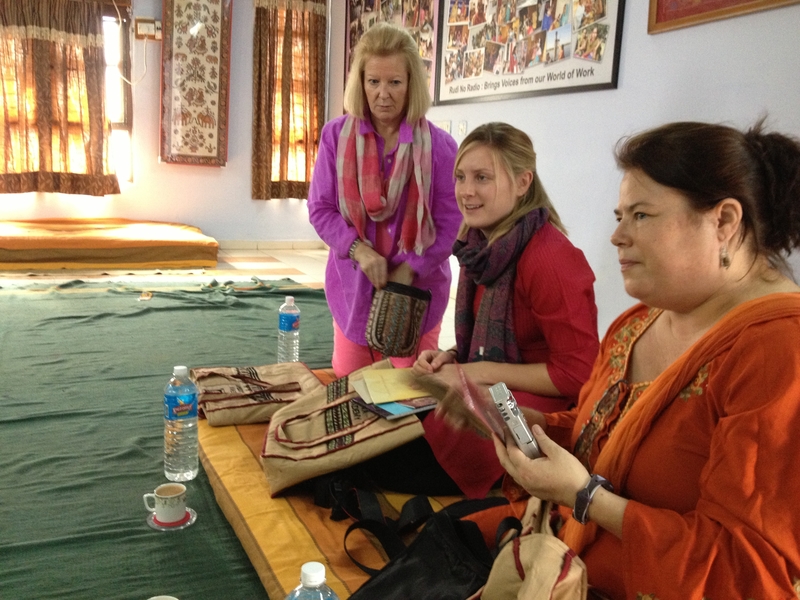 We learned that SEWA Bank provides micro-credit loans, financial literacy training and insurance plans for women. The bank has expanded and now has 7 branches in rural areas outside of Ahmedabad. Another effort from SEWA is to assist with housing options and to help villages build eco-friendly, healthy and sustainable homes to live in. Visiting SEWA was an unforgettable experience and I am inspired by their continual efforts, passion and commitment to give women an identity, a voice to understand and appreciate themselves and contribute to their community. Here is a video slideshow of the photos my group took from the time we spent with SEWA, we made it as part of our final class presentation for the final day in Ahmedabad, enjoy! Thanks Laura, I’m still trying to absorb and process the time we spent with SEWA. It was very intense but also humbling to see how others live their lives, so so different. We learned so much in such a short time. A huge awakening of how many barriers and challenges women have to still overcome in India.